As part of my post graduate research at Sydney College of the Arts my art practice began by raising awareness of water sustainability through public art installations and performative actions using photo-media. While photographing aquatic environments I observed intrinsic tensions within the movement of various bodies of water and the way light travels over surfaces and through layers. This led to my current art research exploring the optical phenomenon of water and glass refractions. My digital photographs recording diffractions and refractions were then rematerialised on to objects and animated through digital screen works. This installation called Deluge consists of an hourglass, face mounted photograph on acrylic (40 x 40 cm), plinth covered in digitally printed SAV (110 x 40 x 40 cm) and polyester fabric print (264 x 224 cm). It will be exhibited in the Concerning Peace group exhibition at Maitland Regional Art Gallery from 25 August – 25 November 2018. My assemblage of photographic and found objects serves as a metaphor for climate crisis and threats to global peace inviting the viewer to contemplate the need for water sustainability. Australia’s recent scandals in the Murray Darling Basin involving water security and conflicts between states around distribution remind us that we live in the driest continent on Earth and this can no longer be ignored. Drought in the Middle East for example has led to war and destabilisation while low lying Pacific islands are becoming uninhabitable due to rising sea levels. The World Bank forecasts that: "Changes in water availability and variability can induce forced migration and ignite civil conflict ... episodes of droughts and floods have generated waves of migration and statistical spikes in violence within countries." 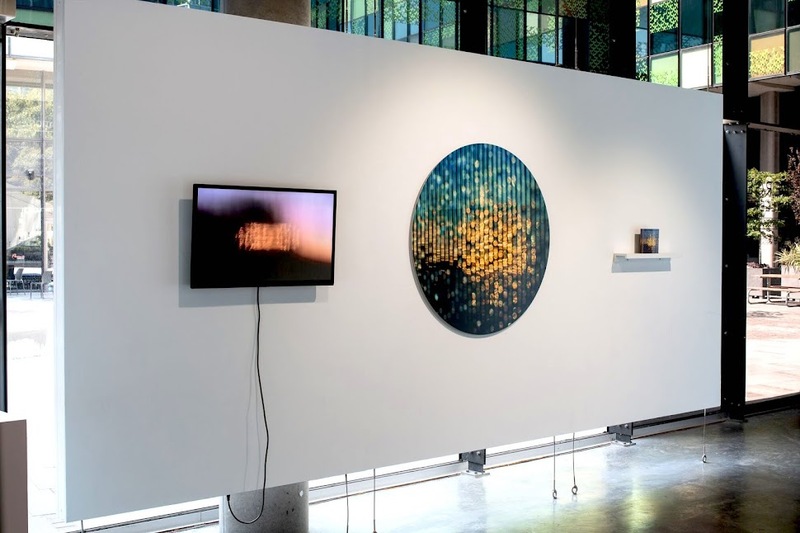 Three person exhibition at Perth Centre of Photography in June 2018 in which I examine the phenomenon of water and glass refractions recording the scattering and polarization of sunlight passing through translucent spaces.These digital traces of light rays are then transposed on different objects such as fabric, aluminium circles and large floor cushion to form provisional assemblages within the gallery. This exhibition stretches the boundaries of photography through explorations of light and objects in real space. 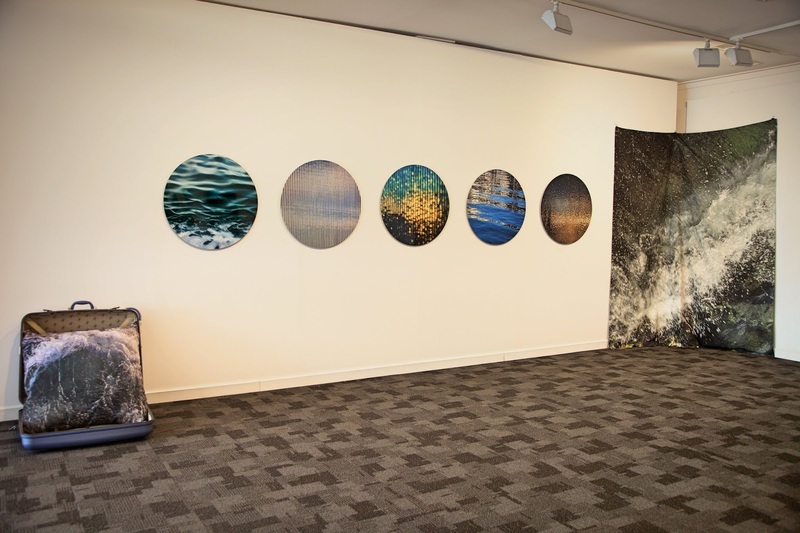 The circular aluminium photographs were sponsored by Print 2 Metal studio in Melbourne. Below: my installation at ElectroFringe17 showing digitally recorded scattered rays of sunlight projected through vintage glass of various refractive indices. 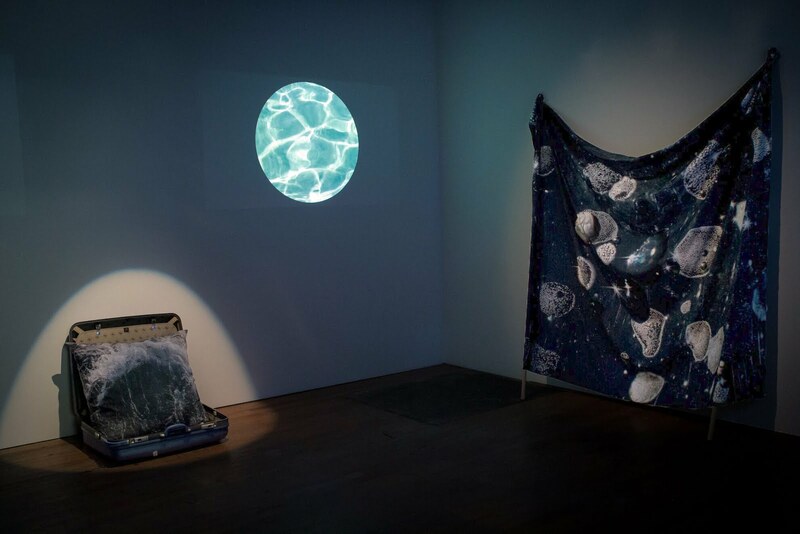 The water and glass refractions are animated and re-projected through translucent materials using a data projector. In this zone of uncertainty light bounces around liminal spaces transforming itself in a process of disintegration and re-emergence. 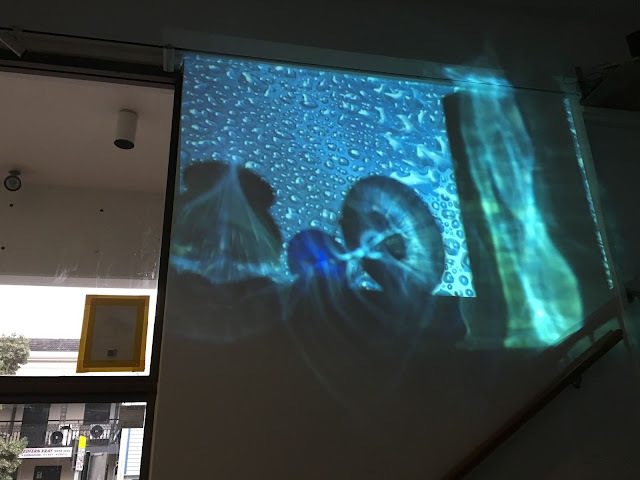 Using my Waterline video loop highlighting coal pollution in Sydney catchments and imagery of water overlaid on walls and pavement over 30,000 visitors pass through semi-immersive projections that create a perception of morphing reality to visualise climate change at Beams Arts Festival 2016. 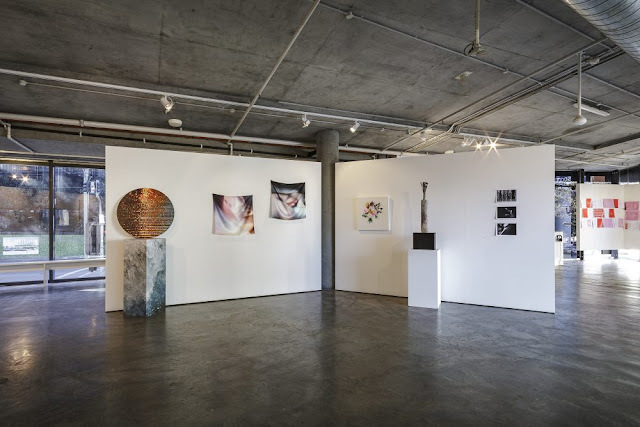 Above: Interactions (on the left) photo assemblage featured in Sydney College of the Arts Showcase at Verge Gallery, University of Sydney. 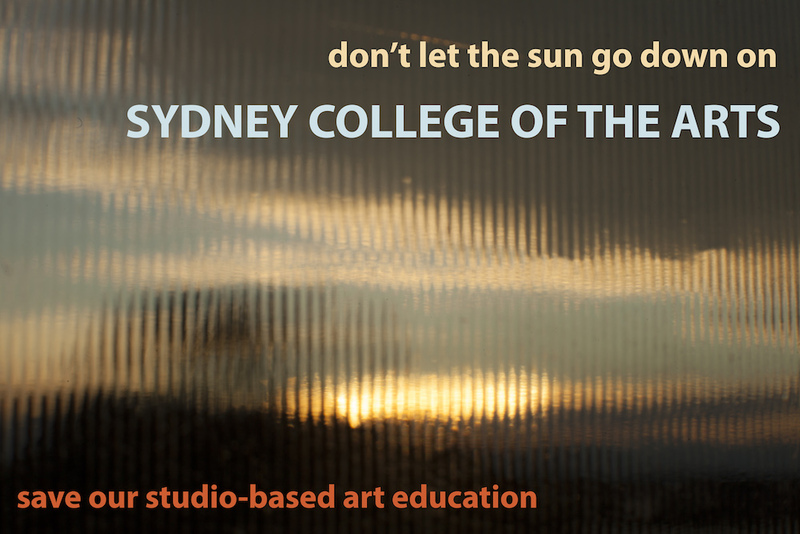 2015 enrolled Master of Fine Arts by Research at Sydney College of the Arts. 2007 Multimedia Certificate IV Hunter Street TAFE, Newcastle. 1981 Bachelor of Education, University of Newcastle, Australia. “Human Intervention on Australian Beaches”, Surfrider Foundation, 1997. ARCO Experimental Cinema Library, Madrid, Spain. State Library of New South Wales, Mitchell Archive, Australia. Bernadette Smith. Simple theme. Powered by Blogger.